The experimental particle physics group at Syracuse University focuses on flavor physics using both heavy quarks and neutrinos, with a primary interest in identifying new sources of CP violation. It also has played leading roles in detector development for a variety of experiments. Currently we are busy helping to build components and work on construction for the MicroBooNE experiment at Fermilab, which will be the largest liquid-argon neutrino detector to operate in the United States. Our theoretical group focuses on phenomenology of the electroweak scale, building models of electroweak symmetry breaking, developing lattice field theory as a technique for studying a range of strongly coupled field theories and working on theoretical cosmology. WHAT SETS PARTICLE PHYSICS AT SYRACUSE UNIVERSITY APART? Our theoretical and experimental particle physics groups at Syracuse work on a broad range of topics and share a common goal of finding and explaining new physics. The experimental group has conducted and continues to conduct pioneering research in flavor physics and is active in all facets of HEP, including hardware, software	and data analysis. 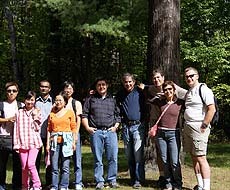 Members of Syracuse University's particle physics group go on a hike in Watkins Glen in New York.